Officially licensed Mississippi State University Bulldogs NCAA 3" x 12" decal strip. Decal strips can be placed on a variety of surfaces, not just a bumper, with their self-adhesive back. Made in USA. Mississippi State Bulldogs - NCAA Laser Tag / Mirror License Plate. Officially licensed NCAA 6" x 12" acrylic mirror license plate with Mississippi State Bulldogs team logo laser engraved in the center. Made in the USA. 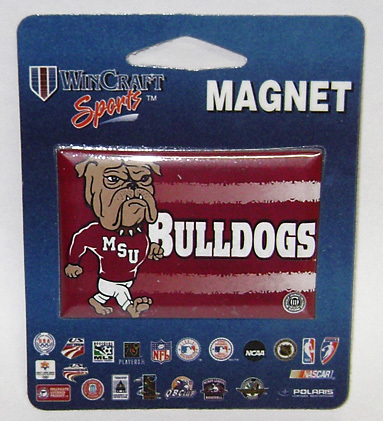 Officially licensed Mississippi State University Bulldogs NCAA 3" x 2" magnet. This magnet is the perfect companion for every refrigerator or metal filing cabinet. Made in USA. Officially licensed Mississippi State University Bulldogs two-sided NCAA car flag, with wall mount. 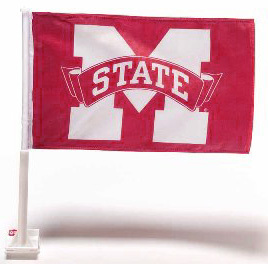 Car flag measures 11" x 18"
Mississippi State University - Mississippi State Bulldogs NCAA 2-Sided House Banner Flag. Officially licensed Mississippi State University NCAA two-sided 28" x 40" house banner, made of heavy-duty 150 Denier polyester, with 1.5" pole sleeve for hanging. This Mississippi State Bulldogs house banner also has a liner, which allows the flag to read correctly from both sides. Durable and weather resistant. 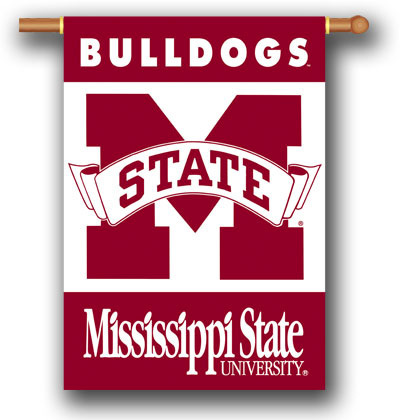 Mississippi State University - Mississippi State Bulldogs NCAA 3' x 5' Premium Flag. Officially licensed Mississippi State University NCAA flag made of heavy-duty polyester, with 2 heavy-duty metal eyelets for flying outdoors. This Mississippi State Bulldogs flag makes a great wall decor indoors.